My initial reaction when first hearing about social media policy and procedures was “uggg, more paperwork! (or should that be screenwork?). You? However the longer I’ve worked in the field of social media, the more I see how important this area is. Paying attention to setting up your social media policy and procedures early on (and continuing to update and adapt this regularly) should be a priority for anyone who is using social media for business and can save you a lot of time and stress in the long run. I won’t go too far here into the risks associated with social media use (I’ll save that for another blog post), but think along the lines of PR disasters where employees voice their own personal opinions on a business page, or where a disgruntled staff member might decide to try and “hijack” social media accounts. Setting up the correct privacy and security settings on all your profiles and limiting what others have access to will help avoid these issues, but creating a thorough social media policy and procedure document will further mitigate risk. If you just work for yourself, at first you may think it’s not worthwhile taking the time to concentrate on this but I’d recommend still taking at least a half hour or so to take a look at this basic worksheet below and considering the questions. At the very least, I’d suggest putting together a document with all of your social media information in one place. Larger organisations would take it even further and use legal advice and wording to ensure that their branding is better protected online. There is a huge amount of information and templates out there on creating your own policy and procedures documents, here are just a few suggestions to check out and please add others you’ve found useful in a comment below! PolicyTool for Social Media: an interactive guide that will ask for some input then present a customised policy guidelines. 57 Social Media Policy Examples and Resources: like the online database, a list of lots of examples for you to take a look through. Please note that I am not trained in or qualified to advise in terms of actual legal issues arising from social media issues. However by ensuring you take the time to create a policy and procedure for your business, you are certainly heading in the right direction of protecting your valuable online reputation and resources. 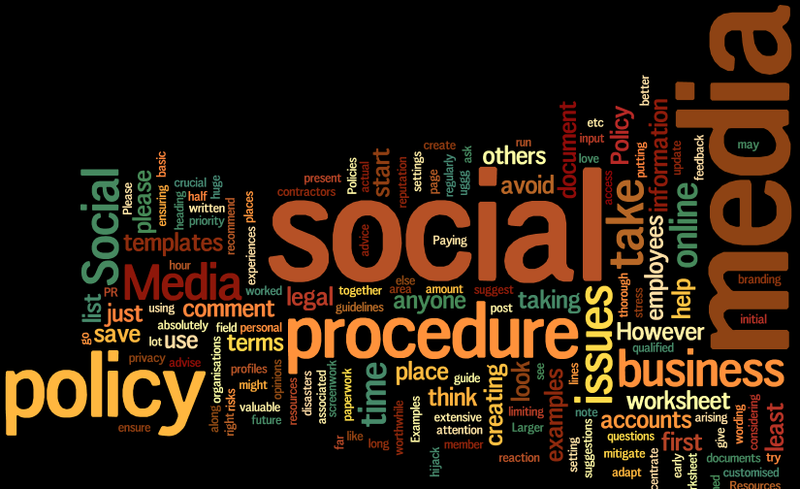 I’d love to hear your feedback and experiences in terms of social media policy and procedures, please comment below. This post is part of the Zestee Social Media School resources. ← What would you most like to learn in social media school?